How Does New Vehicle Pricing Work? When you want to buy a new car, you should be doing a lot of research. Depending on where you are doing your research, you might see multiple prices for the same vehicle. For example, a commercial on TV may advertise a 2018 Hyundai Elantra with a different price than you might see on a website. This might be confusing, but there is a reason for this. Many places will only show you the MSRP of the car (Manufacturer's Suggested Retail Price). This is set by the Manufacturer, for example, Hyundai, as a recommended sale price, and is the only price that someone legally has to show. However, at Don Valley North Hyundai, we want to be upfront about our prices, which is why we include all fees in our pricing. In Ontario, all dealerships must advertise their prices according to OMVIC (Ontario Motor Vehicle Industry Council) regulations. One of the regulations is that we advertise the "All-In Price", which is MSRP plus all applicable fees and levies such as Freight & PDI, the Environment Handling Fee, OMVIC Fees, dealership administration fees, and Tire Levies. Not everyone's advertising complies with this, and sometimes you will just see MSRP advertised. All dealerships will charge the All-In Price, but you might not know that until you're sitting at the negotiation table. At Don Valley North Hyundai, our policy is to be upfront, clear and honest about our pricing. See the graphic posted above for a complete breakdown of pricing. Can I purchase a Hyundai vehicle directly from the manufacturer or distributor? No. All retail sales transactions of Hyundai vehicles are processed directly through Hyundai dealerships in Canada, so you must contact a Hyundai dealer. Hyundai Canada is the distributor of new Hyundai vehicles in Canada and is responsible for the warranties of these vehicles. What is a Trade Appraisal? An appraisal is an evaluation of a vehicle, which represents a dealer's assessment of what the dealership would be willing to pay you for your vehicle. This offer to purchase may be contingent on your purchase of another vehicle from the dealership. Where do I find information on the market value for my used vehicle? To find the trade-in value of your vehicle, go to Appraise Your Trade-In, and enter your information. Yes. If you wish to trade in your vehicle, your selected dealership must conduct an appraisal of this vehicle. However you can get an estimate of your trade online using our Appraise Your Trade-In tool. Wouldn't I be better off financially to sell my current vehicle privately? There may be costs involved with selling your vehicle privately. Many customers find that the convenience of trading in their currently owned vehicle, plus the tax savings it provides on the new vehicle purchase, provide a benefit when compared to the time requirements, financial costs (such as advertising, vehicle repairs), and hassle, of selling a vehicle privately. I have heard of the Red Book / Blue Book. What is the Black Book? Canadian Black Book is a highly regarded and extensively used independent third party organization, specializing in the valuation of used automobiles in Canada. 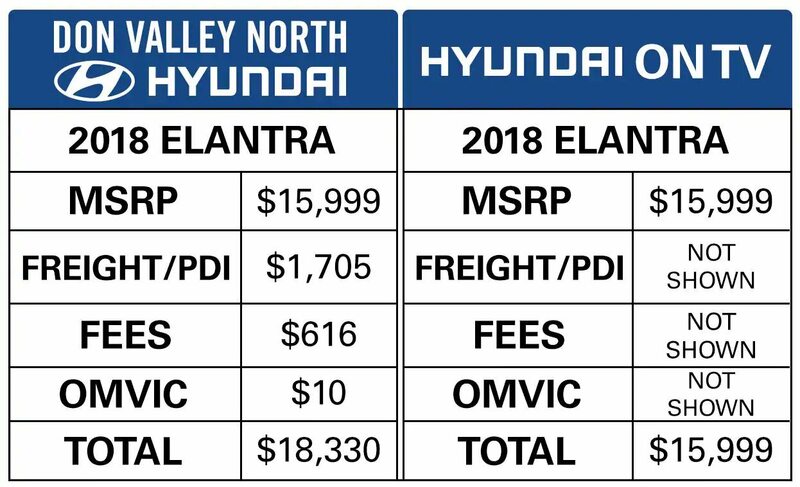 Hyundai is pleased to present you with this third party data as a reference in estimating the value of your current vehicle. 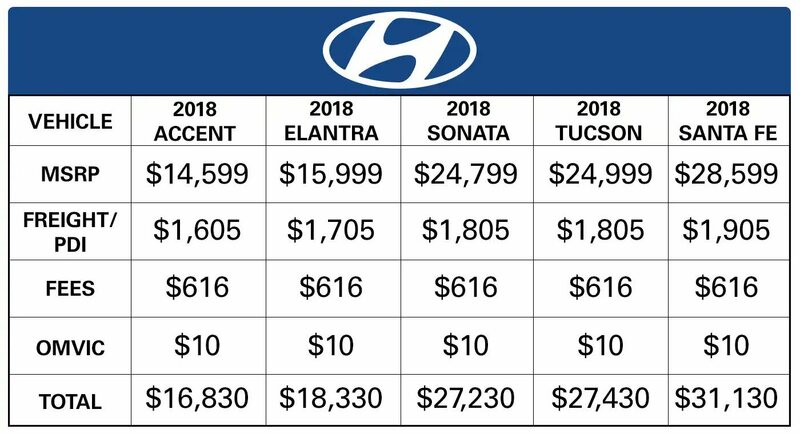 The actual cash value of a trade-in vehicle can only be determined through an appraisal at a participating Hyundai dealership. What are the advantages of booking a sales appointment at a dealership? Dealerships are busy at different times of the day and week. Although every attempt is made to staff accordingly, there may be occasions when a customer is required to wait to speak with a Product Advisor. By pre-booking your appointment, you are assured that a Product Adviser will be available to help you at a time that best suits your schedule. Can I use my Line of Credit to pay for my vehicle? It's probably in your best interest NOT to use your Line of Credit to pay for your vehicle. Some important reasons why: 1. Floating interest rate - fluctuates with the prime rate. 2. The bank has the right to withdraw money from your account to pay for your line of credit. 3. Secured lines of credit use your home as collateral. Default of payment for any reason allows the bank to take your home. 4. The bank may require the total balance of your line of credit paid in full if you die, become insolvent or bankrupt. 5. If the bank sees any increase in risk to the security they can demand full payment. 6. Home insurance costs may be higher due to the additional line of credit. What is the E.H.F. - Environmental Handling Fee? The Environmental Handling Fee is comprised of two portions: 1) Stewardship Ontario Oil Filter Fee and 2) Stewardship Ontario Tire Fee. The Stewardship Ontario Oil Filter Fee is either $0.50, or $1.00 depending on the size of the filter. Filters <8" in diameter carry a charge of $0.50, and Filters >=8" in diameter carry a charge of $1.00. The Stewardship Ontario Tire Fee is $5.84 for each commercial tire. If your vehicle comes with 5 tires, the total fee would be $29.20. Together these are referred to as an EHF Fee, and commonly comes to a total of $30.20. What is the OMVIC fee for? OMVIC stands for Ontario Motor Vehicle Industry Council. OMVIC's mandate is to maintain a fair, safe and informed marketplace by protecting the rights of consumers, enhancing industry professionalism and ensuring fair, honest and open competition for registered motor vehicle dealers. Dealers are required to remit $5 for applicable transactions as of February 1, 2008. The applicable date for determining whether a particular transaction is subject to the transaction fee is the date the agreement with the customer was entered into (i.e. not the date the vehicle is delivered or the date registration is transferred to the customer). The Ontario Motor Vehicle Industry Council enforces the Motor Vehicle Dealers Act (MVDA). "As the regulator of motor vehicle sales in Ontario, OMVIC's mandate is to maintain a fair, safe and informed marketplace by protecting the rights of consumers, enhancing industry professionalism and ensuring fair, honest and open competition for registered motor vehicle dealers. It's important car buyers understand the protections and rights they have depends entirely upon whom they buy from. Consumers who purchase from registered dealers are protected by OMVIC and are entitled to full disclosure and all-in pricing. Consumers who buy privately have NO protection; no consumer law covers private transactions." For full information on OMVIC please see this website. What is Excise Tax for? An excise tax of $100 is payable for vehicles with air conditioning that are purchased in Canada or imported from the United States. This tax is payable to CBSA at the border when the vehicle is permanently imported into Canada. Excise tax (Green Levy) on fuel inefficient cars This tax is applicable to vehicles purchased in Canada or imported from the United States and is applied to a passenger vehicle if it: is a car, SUV or van with a weighted average fuel consumption of 13 litres per 100 km or higher, and was put into service after March 19, 2007. Vehicles are taxed, based on weighted average fuel consumption, at the following rates: At least 13, but less than 14 litres per 100 km: $1,000 At least 14, but less than 15 litres per 100 km: $2,000 At least 15, but less than 16 litres per 100 km: $3,000 16 or more litres per 100 km: $4,000 For more information, please visit this website. In Canada, we're pretty used to paying more than the price we see on a price tag. In Ontario, sales tax is now 13%, meaning whatever the price you see is, add 13% to it for your final price. But when you are looking at buying a new car, you'll usually see a set of fees that you hadn't seen before. What the fees are called might vary depending on the dealership, but most often they'll be called "delivery and destination" or "freight and PDI." But what does that even mean? What are these fees and why do you have to pay them? Freight, or destination, is the charge for getting the vehicle from the factory to the dealership. This could involve shipping the vehicle from across an ocean, driving a vehicle across the country or packing something up a bit more delicately. Manufacturers set the freight price based on the nameplate for the vehicle, so no matter where you are, you'll pay the same price. Many vehicles are not manufactured in Canada, so this set fee ensures that even if the vehicle is shipped from somewhere overseas like Japan, you'll still pay that price. These costs are also standard across the country, so someone in B.C. will be paying the same fee as someone in Ontario. This fee will usually be higher with bigger and more luxurious vehicles, as the cost to transport them will be much higher than a regular sized vehicle. PDI, or delivery, is the charge for a technician at the dealership to inspect the car to make sure it has no cosmetic or mechanical issues. Just because a vehicle is brand new from the factory, doesn't mean it's ready for you to take home. It's also for the wash crew to run the vehicle through the car wash and make sure the car is presentable for the new owner. They'll also apply any final touches they need such as filling up the gas tank and topping up fluids. While the MSRP (Manufacturer's Suggested Retail Price) is the most common price you'll see in many commercials and advertisements directly from a manufacturer, that price doesn't show the whole picture. At Weins Canada, we practice something called "All-In Pricing." This means that the price we advertise includes the MSRP plus all fees, except for HST and licensing. So the prices you see on any of our dealer websites include the freight and PDI fees. This practice makes it easier for you as a customer to know exactly what you're going to be paying for a new car. What is a MTO Safety Standards Certificate? An Ontario Ministry of Transportation (MTO) Safety Standards Certificate (SSC) is a document that certifies a vehicle's fitness. You can buy and register a vehicle without a safety certificate, but you cannot put your own plates on the vehicle or drive it without one. Any inspection station in Ontario licensed by the Ministry of Transportation can issue a Safety Standards Certificate, provided your vehicle passes an inspection. A Safety Standards Certificate is valid for 36 days after the inspection. However, the certificate is not a guarantee or warranty that the vehicle will stay fit for any period. What is a Safety Standard Certificate (SSC)? An SSC is a certificate that is issued by a government- approved Motor Vehicle Inspection Station (MVIS) after a vehicle passes an inspection. This inspection covers the minimum safety requirements for vehicles in the province of Ontario. When do I require an SSC? An SSC is required when: registering a rebuilt motor vehicle; transferring a used motor vehicle to a new owner as fit; registering a motor vehicle in Ontario that was previously registered in another province or country; changing the status of a vehicle from unfit to fit. Is an SSC a warranty on my vehicle purchase? An SSC is not a warranty or guarantee on the general condition of the vehicle. The SSC only certifies that on the date it was issued, the vehicle met the minimum safety standards as set down by Regulation 611 of Ontario's Highway Traffic Act (HTA). How long is an SSC valid for? For the purposes of transferring ownership, an SSC is valid for 36 days from the day that the SSC was issued. For full details, please visit this website. What is a CarProof vehicle history report? CarProof is electronically connected "live" to their data sources. This means that data is always current. Other services purchase periodic data dumps that will often miss information that we capture. CarProof is the only service that provides consumers with guaranteed cross-Canada lien search information. CarProof is connected live to each provincial and territorial Registrar responsible for maintaining these records. Other vehicle history report companies, including Carfax, do not report any Canadian vehicle lien information. Further, only CarProof offers a guarantee regarding enforceable liens. CarProof has access to critical accident data that will allow you to make a more informed decision when buying or selling a used vehicle. CarProof is the only service that is available to consumers providing critical real-time registration and branding information. This information discloses in which province or territory a vehicle is and/or was registered and what brand is associated with the vehicle (stolen, salvage, rebuilt, non-repairable, normal, etc.). CarProof provides consumers with data from one of the largest U.S.-based vehicle history services. Through our connection to Experian Automotive's 2 billion+ record database, all of our reports include the data you would get from other popular U.S.-based vehicle history report services, but we also include important auction declaration information that others do not. What is an AS-IS vehicle? An AS-IS vehicle is unfit, not e-tested and is not represented as being in road worthy condition, mechanically sound or maintained at any guaranteed level of quality. The vehicle may not be fit for use as a means of transportation and may require substantial repairs at the purchaser's expense. It may not be possible to register the vehicle to be driven in its current condition. Our admin fee on vehicle purchase or initial lease is $499. The admin fee on vehicle lease buyout is $699 and is charged by HMF. What is Simple Interest Financing? Simple Interest financing is the consumer friendly way to calculate interest. Like the name implies, the concept is simple. If you pay a day early, you are credited for a day's interest. If you pay a day late, you pay a day's interest. What's the difference in payment between a lease and a finance loan? Here is an example that shows the difference in your monthly payment depending on whether you lease or finance your vehicle. The MSRP and rates used above are approximate and used only as an example. Please see your Dealer for current finance and lease rates. *Taxes (GST & PST) are 13% in this example. New car, all the time. Leasing a car means you always get to drive around in a nice new car. For many people, this is an emotional boost that can't be ignored. If you love cars and driving, this is a big perk. Less maintenance issues. Because you're always driving a newer car, you usually don't have to deal with the regular maintenance issues that car owners face as their vehicles age. You turn in your car before all those problems start showing up (e.g. worn rotors or slipping transmission). If you lead a very busy life, or you're on the road a lot, this is one less stress you have to deal with. Leases are tax deductible for small businesses. If you're self-employed, commissioned sales or you own a business, you can write off your lease as a business expense. This means up to 80% depending on usage and mileage driven. "Afford" a nicer car. If you've ever wondered how it is that so many people can afford to drive an ***CAR1*** or ***CAR2***, then wonder no more. According to LeaseGuide.com, around 75% of all luxury cars are leased. The reason is because banks don't like to loan out more than $30,000 for a car loan. If you want a car that's worth more than that and you don't have the money to make up the difference, leasing is your only option. On the upside, your monthly payment will be lower than if you actually bought a car. Leasing allows you to "afford" a nicer car than you'd get if you had to buy it. Few upfront costs. Speaking of costs, leasing allows you to get into a car with very few "upfront" costs. You often don't need a down payment (or if you do, it's fairly low), your monthly payments are lower, and your sales tax is going to be a lot lower since you only have to pay tax on the value of the car you actually used. According to Edmunds.com, this means that during the life of your lease, you're going to pay roughly half the sales tax you would if you bought the car. Cost of Interest. The cost of interest on a lease is equal to 1% less on a finance. This because on a finance you are paying interest on the tax you paid up front for the purchase. The lease only calculates the interest on the cost of the car and tax is paid on the monthly payment. Buy what appreciates. Regardless of the car you choose it will lose value over its lifetime. Use your cash to pay down high interest debt, pay down your mortgage or top up your RRSP. All will save you money and in the case of your mortgage or RRSP increase your net worth. A car is a bad way to invest your money. Lease the car, pay for the usage and then decide if you want to keep it by buying it out or replacing it. Lots of options and your money is still at work for you. Cash Flow. For the same cost of a car loan, leasing provides a lower monthly payment. With the rising cost of gas, maintenance and insurance you can have your car payment, insurance and some of you gas or maintenance for the cost of a monthly loan payment. Flexibility. Long term loans stretch your borrowing, thus locking you in for a longer period. Leasing allows you to turn your car over in a shorter time. Or if you have a career or lifestyle change you simply pay of the difference between the lease payout and the cars value to move the car or get into a new one. A properly structured lease will give you the options you need if required. An open lease is for someone who wants a lower residual value or who is looking to lease and then buy their car. The lessee guarantees the residual value. Closed end leasing allows you to lease with a specific mileage allowance and return the car at the end of the lease if you at or under this mileage with no additional cost. You are responsible for excess wear and tear on a closed end lease. We allow you to trade in your lease for a new or preowned vehicle. We also offer lease extensions or you may buyout your lease. The insurance company will settle the claim based on the mileage and market value of the car, like they would if you financed. In most cases the settlement will payout the vehicle. But if you have higher mileage then you may have to pay some money. Usually the deductible is payable. On new cars insurance companies offer a waiver of depreciation coverage that will pay off the replacement value of vehicle. This coverage will vary from 18 months to 60 months depending on the company. Ask your broker for this on all new lease vehicles. Leasing is just an alternative form of financing a vehicle. Instead of paying your loan to zero the residual value is set for the vehicle. This residual value usually reflects the future value based on a specific mileage. For example a lease will allow 24,000 km per year and the residual value will be set for this mileage. You then have the option at the end of the lease to buyout your lease, return it if it is under mileage or extend your lease till you buy it or trade it for a newer model. Most leases allow for you to negotiate the selling price or capital cost of the lease. You can trade in your owned, financed or leased vehicle against a new lease. Remember that if you have a finance or lease the trade value will need to cover paying out the vehicle. A fully owned vehicle will act as a down payment with the benefit of saving you the HST on its value. Any equity in a financed or leased vehicle will also act as a down payment toward your new lease. If you would like to end your lease early our dealership can assist you with either buying out or trading in your lease. To do this, a buyout amount will be calculated, a buyout is simply what you owe on your lease. If your vehicle is worth more than you owe you can put that equity towards your next vehicle. If it is worth less than you owe will have to cover that shortfall by either paying the amount, or adding it to your next lease. When you purchase a vehicle you pay all the tax up front. When you lease a vehicle you pay the tax on the monthly payment. Not all leasing companies are licensed to do business in other provinces. So you may need to either return your lease and settle your lease or have someone take over your lease. Every lease has a predetermined mileage allowance. You will be responsible for any mileage over your allowance. So always make sure you negotiate enough mileage to cover your driving habits. I t can be expensive to pay it at the end of the lease in one lump sum verses paying a little more each month on your lease. Yes, you will have a payout that needs to be covered on your lease. If your vehicle is worth the same or more than the payout you are good but if it is worth less you will have to pay out the difference. Some leasing companies will allow you to add this deficiency to a new lease. This will vary from brand to brand. Not all leasing companies offer used car leasing. WCL will lease used cars dependent on the age and mileage. In Ontario full disclosure leasing is a law. Your interest rate will be displayed on your contract for you to see. In a loan you pay interest on the total amount financed or lease. So you will pay interest on the total amount of the lease not the difference between the amount financed and the residual value. This is the same basic premise as a loan or mortgage. You can lease a vehicle for as little as 12 months and as much as 60 months depending on your need and your budget. You are required to have full insurance coverage on a lease, no different than a bank finance, this means liability, collision and comprehensive coverage. Yes you can buy extra mileage up front, we allow for mileages up to 50,000 km per year. It is cheaper to pay them up front than at the end of the lease. Yes you may be able either refinance or release your lease. We offer both options. If you can claim any portion of your vehicle for business then you may be able to write off your lease. Check with your accountant to be sure. With interest rate so low you may want to explore both options and see what will give the best payment. A longer term finance even at a lower rate can cost more than a shorter term lease. Right here! Canadian Black Book can give you an approximate value of your trade in. Accident claims, wear and tear and market conditions will affect this value. Right now! Leasing a vehicle is a great idea any time. You could argue that the BEST time may be 5 minutes to closing time, on New Years Eve, during a snow storm. But the real answer is anytime. The better brands have a good resale value. They will give you the best lease value as they will have a higher residual value. Where can genuine Hyundai parts be purchased? Genuine Hyundai parts and accessories are sold through our Parts Department. Our Parts Personnel can determine the availability and price of the parts and accessories required, and can assist in the processing of your order. Are genuine Hyundai oil filters better for my Hyundai? There may be differences between genuine Hyundai filters and aftermarket filters. Genuine Hyundai filters are designed and engineered to fit Hyundai vehicles specifically and to maintain the filtration of dirt or particles within the oil to match the recommended oil change interval of 8000 km. Aftermarket filters may not have the same fit or be manufactured to the same standards as genuine Hyundai filters and may cause engine concerns. No. Non-Genuine Hyundai Parts, or any damage or failures resulting from their use, are not covered by any hyundai warranty. Only Genuine Hyundai Parts and Accessories are covered by the Hyundai Replacement Parts and Accessories Warranties. My seatbelt fits too snugly. How can this be corrected? Why should I service my vehicle at a Hyundai dealer? Our dedicated Hyundai Service Advisors will recommend services based on the Maintenance Menu set by the manufacturer. By following your vehicle's service schedule, you will ensure your warranty coverage and prolong the life of your vehicle. Our factory-trained Technicians work on Hyundai's all day, every day. They are familiar with every Hyundai model and use Hyundai Genuine Parts to provide optimal performance. Why do I need a battery service? This service helps avoid potential no-start conditions which are a concern to owners due to the inconvenience caused by such a failure, especially given our extreme weather conditions. Batteries should last for years but slow engine cranking or dim headlights are a sign that your battery requires attention. Why do I need a 4 wheel alignment once a year on every 24,000kms? Proper alignment and wheel balance maximizes your vehicle's ride and handling performance while preventing unnecessary tire and suspension wear, which means fewer replacements later on. What does it mean when my Check Engine Light comes on? Is my vehicle safe to drive? The Check Engine Light is an indicator from your engine computer that something is not right. It covers a wide range of issues that could be as minor as loose gas cap to more serious issues like a malfunctioning oxygen or mass airflow sensor. As long as your vehicle feels normal it is safe to drive, however you should have it inspected as soon as possible. If the vehicle is not driving normally, say the engine is shaking or vibrating, you may consider having it towed to the dealership to prevent any further damage or to prevent being left stranded on the road. Preventative recommendations are regularly scheduled services that ensure the safety and reliability of your vehicle. Regular maintenance prevents potential problems and actually saves you money on repairs. It is easier and cheaper to keep something in good condition than it is to fix something when it breaks. What is a recall or campaign? A recall or campaign is released when there is a safety related issue on your vehicle. Recalls are fully covered under warranty so any replacement of parts or service updates will be completed at no charge. Recall notifications are sent to owners by registered mail. Does my Hyundai vehicle have a timing belt? Some vehicles do not have timing belts because they are equipped with a timing chain. You can check your vehicle's Maintenance Menu to see if timing belt replacement is recommended or you can contact the dealer for advice. What is a complete fuel system service? Environmental conditions, driving habits or poor quality gasoline can cause build-up in your vehicle's fuel and combustion systems, compromising both fuel economy and performance. The service cleans and eliminates contaminants and deposits in the combustion chambers and on intake and exhaust valves. Why is it important to replace my brake fluid? Brake fluid is a type of hydraulic fluid used in hydraulic brake applications in automobiles to provide optimal braking performance. Brake fluid is used to transfer force under pressure from where it is created through hydraulic lines to the braking mechanism near the wheels. It also lubricates braking system components and prevents corrosion of metal brake lines. Why do I need 4 wheel brake service? Due to the added forces of friction when braking and turning, your front tires will usually wear at a faster rate than the rear tires. Regularly rotating your tires will help you achieve more uniform wear and increases the useful life of all four tires. Engine air filter prevents harmful particles from entering your engine and causing damage. Air filters eventually become clogged with trapped particles and as a result this will reduce engine performance. A clogged filter starves your engine for air, reducing fuel economy and increasing emissions. Can I turn off my daytime running lights? Please remember, daytime running lights (DRL) are a safety feature that can help make it easier for others to see the front of your vehicle during the day. This is especially helpful in the periods right after dawn and before sunset to increase visibility to other motorists. If your vehicle is equipped with a "DRL OFF" setting, they can be turned off by twisting the headlight control knob to "DRL OFF." For vehicles listed below equipped with DRL, the system can be disabled by your local Toyota dealership. Be aware that models equipped with the Automatic Headlamp feature will default to a standard or manual headlight function and will no longer turn the headlamps on automatically after this modification.Please contact your local Hyundai dealership for details. For all other models equipped with DRL, Hyundai does not recommend any modifications. Where do I find the recommended tire pressure for my Hyundai? Tire pressure is specified in your Owner's Manual and may also be found on the label inside the glove compartment door or on the driver's door pillar. What precautions do I need to take during the break-in period for my new Hyundai? A few simple tips for the first 1,600 km can add to the future economy and long life of your new hyundai. These tips can be found in your Owner's Manual. Refer to the index for the exact page location. Where can I locate the Vehicle Identification Number (VIN) on my vehicle?